Dental implants have made restorative dentistry better than it has ever been. That’s true across the United States, including right here at our dentist office in Alma, MI. Mini implants have given us so many great options to restore the smiles of patients who have lost one tooth, multiple teeth, or all their teeth. Tooth implants are a huge step up from the traditional dentures that you may remember your grandparents using. What we can offer at Mid-Michigan Dental Excellence is the closest thing you can get to a new set of teeth. 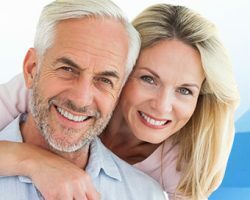 Schedule a consultation today to learn if our dental implants or mini implants could help you or someone you love. Dental implants are replacements for the roots of your teeth. That sounds simple, but implants do a lot for you and your oral health. Roots play a vital role in your mouth. First, they anchor your teeth in place. This makes it much easier for your to bite and chew the food that you eat. A healthy person who has all of his or her teeth can generate between 200 and 250 pounds of pressure. That is more than enough to bite into an apple or corn on the cob and to comfortably chew a bite of steak or chicken. But your roots aren’t just holding your teeth in your jaw, they are helping to maintain the health of your jaw, too. With each bite and chew you make, your roots press into your jawbone. That pressure leads to new bone tissue growth, which keeps your jaw healthy. Dr. McDonald knows both from his education and his experience what happens when you start losing teeth. Without roots or tooth implants to create pressure, your jaw will begin to shrink in the parts of your mouth without teeth. Our team at Mid-Michigan Dental Excellence prefers to help you do everything you can to keep as many teeth as possible. If you should lose teeth, then we do recommend getting dental implants as part of your restorative dentistry. We offer mini implants at our office instead of traditional implants. As the name suggests, mini implants are small than traditional tooth implants, but mini implants can serve the same purposes. Mini implants can support a dental crown if you need to replace a single tooth. Mini implants can support a dental bridge if you need to replace multiple teeth, and Dr. McDonald can place a series of mini implants to hold your dentures securely in place. ➤ You will heal faster. As great as dental implants are, there are some things you can’t avoid. When tooth implants are placed in your jaw, you need time to heal before teeth replacements like bridges or dentures can be attached. With full-size dental implants, you may need several months before your jaw is sufficient healed to support your dentures or dental bridge. By using mini implants, we can significantly cut down the time you need to heal. That means you can get your dentures or bridge sooner and start enjoying the benefits of this restorative procedure. ➤ Mini implants will fit in smaller spaces. One of the wonderful things that dental implants do is help you maintain the health and the shape of your jaw. Spurring new bone growth keeps your jaw health, and it keeps your teeth implants secure. The problem is when your jawbone has shrunk too much already. When this happens, you can’t support full-sized dental implants. There are ways to build the bone back up with a bone graft, but that can set back your implant placement by several months. Mini implants can fit in smaller spaces. Patients who could not receive full-sized implants often can receive mini implants without adding any additional steps in the process. ➤ Mini implants are more affordable. This is partly a function of their size. They are smaller, so they used less material to make. But as we mentioned above, they can simply your treatment, too. If you had to have a bone graft before you could get your implants, you would be paying for both procedures in time and out of your bank account. With mini implants, you pay for one procedure with a less costly product, and you can still enjoy the same benefits in the long run. Make an appointment with Dr. McDonald today if you would like to find out if mini implants can restore your smile and your ability to eat comfortably. Call 989-796-4848 or contact us online to schedule your visit to Mid-Michigan Dental Excellence in Alma, MI.